Referrals to private attorneys are available. Private attorneys may charge for their services. Some lawyers offer limited-scope and modest means representation, which can be helpful to persons with limited financial resources. A service provided by the Nebraska State Bar Association. The service refers callers to private practicing attorneys in Douglas and Sarpy counties. For more information call (402) 280-3603 or visit the link above to submit an online request for an attorney. NE Free Legal Answers is a free, online legal advice clinic where qualifying low-income Nebraskans can ask a volunteer lawyer a question about a civil (non-criminal) legal problem. Visit www.NE.freelegalanswers.org for more information and to see if you qualify to use the service. To qualify, you must be at least 18, reside in Nebraska, you can't be incarcerated, and your household income and assets must meet poverty income guidelines. Qualifying users will receive an email message to log back in to the website if a lawyer responds to the question. 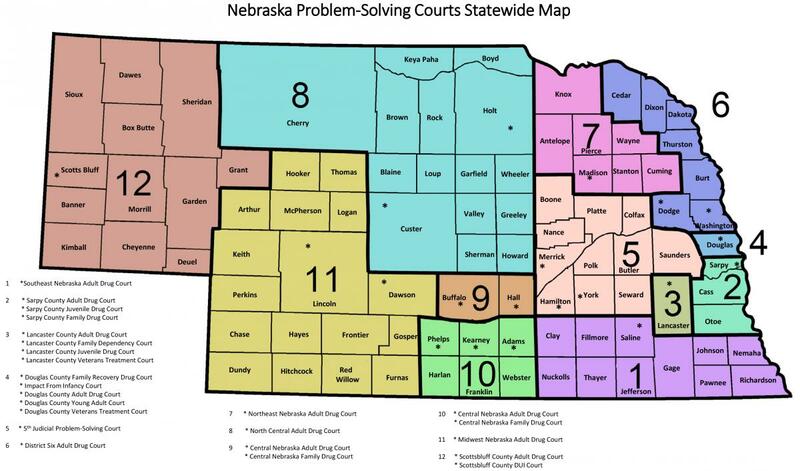 Legal Aid of Nebraska has two A2J Centers. These centers are self-help centers in Lancaster and Douglas Counties where low-income people can access legal resources including computers, forms, and self-help clinics. The Omaha A2J Center is located at 209 Farnam Street, Suite 200. The Lincoln A2J Center is located at 941 "O" Street, Ste. 825. Call (402) 348-1069, or toll-free at (888) 991-9921, or, visit our website at http://www.legalaidofnebraska.org/get-help/help-yourself-access-to-justice/ to find out more information. A Self-Help Center is a free, walk-in legal information and resource center for low-income persons representing themselves in court. There are Self Help Centers in courthouses in several counties. A Self Help Center is not a substitute for professional legal advice. When you cannot afford a lawyer, however, a Self Help Center can provide legal information and resources to help you resolve a legal problem on your own. Please visit the Nebraska State Bar Association Volunteer Lawyers Project Webpage for more information about Self Help Centers. University of Nebraska College of Law Legal Clinic: A limited number of civil cases are accepted by the UNL Legal Clinic. Clients are represented by students under the supervision of College of Law faculty. Call (402) 472-3271 to find out if they are currently taking new cases. Creighton University School of Law Legal Clinic: For Douglas County residents only. Call the Clinic at (402) 280-3068 between 9:00 a.m. and 4:00 p.m. Monday through Thursday. A limited number of cases are accepted by the Creighton Legal Clinic. Clients are represented by students under the supervision of Law School faculty. The Nebraska State Library is a public law library located on the 3rd floor of the Capitol Building, Room 325. In addition to print materials, there are computers for conducting legal research and free WIFI. A reference librarian is available to assist in person, by phone (402)471-3189, or email NSC.lawlibrary@nebraska.gov. The UNL College of Law Library is located on the east campus of UNL. There is one public access computer to conduct legal research. The general telephone number to the law school is (402) 472-3547. The Creighton Law Library is located in Omaha on the corner of 21st and Cass Streets, on the second floor of the Ahmanson law Center. There are public access computers for legal research. Reference assistance is also available. The general phone number is (402) 280-2875. Each branch has a unique collection. Your local public library may have some legal resources and public access to computers and the internet. To find your local library click the link above. The Douglas County Law Library is located in Room HO7, Civic Center, 1819 Farnam Street in Omaha. The Library is open to attorneys and the public for limited use. The materials in the library are available for use on the premises only, no materials may be checked out. There are copy machines available for self-service coping and scanning to a USB device. The library staff is available to assist you in the library. The phone number is (402)444-7174. Mediation Centers provide a neutral third party mediator who has no decision-making authority and is impartial to the issues being discussed. The mediator is present in order to assist the parties to voluntarily reach a mutually acceptable settlement of the dispute. For more information call the Nebraska Office of Dispute Resolution, 402-471-3148 or visit the link to find the Mediation Center serving your portion of the State. Mediation at these centers is offered on a sliding-fee scale based on the income of the participants. Catholic Charities Immigration Legal Services helps clients with filing a variety of USCIS forms. Their services consist of legal consultations in which they evaluate clients’ immigration legal options, advise them how to proceed, and represent them throughout the legal process. Consultations are by appointment only. To make an appointment, call any one of their offices. Disability Rights Nebraska provides information and referral services to all persons free of charge. They provide direct advocacy services to individuals with disabilities. In order to receive representation, the individual must meet certain basic eligibility requirements set by their funding sources and have a legal problem that is associated with the disability and that falls within priorities set by the Disability Rights Nebraska Board of Directors. A fee may be charged for legal representation based on the client’s ability to pay. Nebraska Appleseed is a nonprofit organization, who’s mission it is to fight for justice and opportunity for all Nebraskans. Their legal services most often include referrals, legal information, and supportive advice. Because their litigation is focused on systemic issues, Nebraska Appleseed does not typically handle individual representation cases. The eight area agencies on aging plan and promote the development, enhancement and promotion of community services and activities for older persons. The agencies create social and physical environments where the older citizen has maximum opportunities, both individually and collectively, for personal expression and growth. Special emphasis is given to supporting and prolonging independent living through ensuring the right care is provided at the right time. They have services available that provide legal advice, counseling and representation by an attorney or other person acting under the supervision of an attorney. The Law Center provides professional legal support and advice to command and other staff agencies on a variety of issues including military justice, contracts, labor, environmental and operations law. They also provide legal advice and assistance on personal and civil matters to military members, retirees and their family members.